Having grown up boating all over Long Island, NY then ending up on the west coast with boating limited to the open pacific it sure make me dream about taking a trip from Main to Miami. The other day I started to think about such a trip when I retire and what boat would best fit this journey. I would likely make this trip alone in the fall and was thinking about the 26' Wasque or something similar. I want to keep the boat simple and stay close to nature on this trip. After years of owning and living aboard a Nordhavn it does make you fell like to left the water. I too grew up on LI and in NY, NY. Boated all over... LI NY to and including Penobscot Bay Maine as well as most ports in between, small 23' to midsized 38' during latter 50's to mid 70's. Currently we boat in SF Delta and Bay. I love the 1000 + miles of delta canals’ (much warm fresh water swimming in spring, summer, fall) with many small towns, small cities, hundreds of islands, and even Sacramento at the top. I keep a tri cabin about mid way up the delta and often have a sport fish convertible in the Bay. Sold my last sportfisher... looking for another. Your vision of doing Maine to Florida in a small boat sounds like great adventure! I sure wish you best luck, fair weather, and smooth sailing... errr powering! The 26' Wasque seems to be a real nice representation of old model Lobster Boats. I played with lobstering in early 70's in mid Penobscot... Camden, Rockport, Rockland area. I will always regret bringing my boat from Maine to Miami on a truck. I think the Wasque 26, Dyer 29 or any of those small Yankee single engine boats would be a good choice. I'm partial to the Ellis 28. They have a turn of speed when you want it but are economical if you go slow. In that size boat your going to have a V-berth to sleep in. A basic galley and probably a combination head / shower. I can live like that for a week or so at a time, then I want a hotel room and nice restaurant. Shouldn't be a problem on the East coast. I don't need no stinkin' flying bridge. The bridge belongs in the pilothouse. Nothing wrong with Marks boat except it needs a crows nest up on that mast. "Tuna tower is what it really needs... "
Oooh, nice. How about we get Mark to install a flying bridge, tuna tower and a crows nest on top of it all? 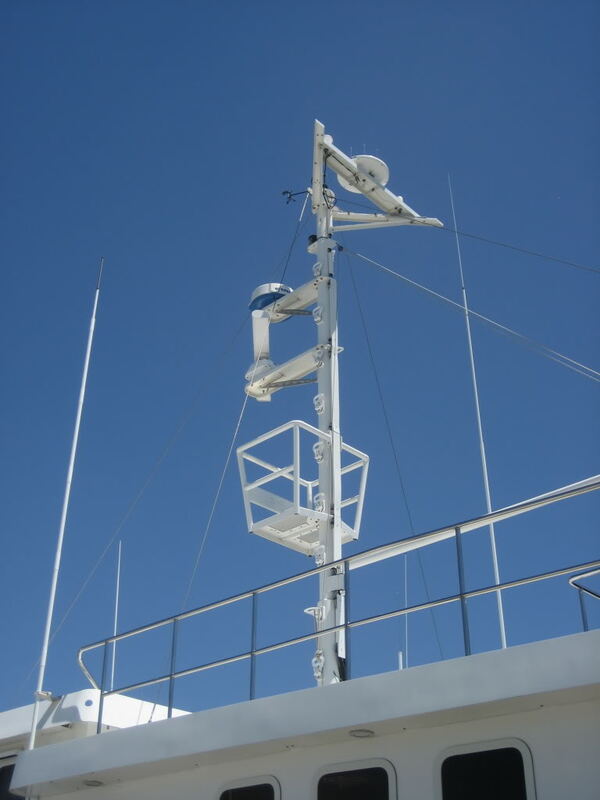 Back on topic, sort of, I knew a guy who had a Jarvis Newman Yankee boat that he put a mast with crows nest on. He had steering and controls up there. He said it was so he could navigate through shallow water. I think he just wanted to be left alone. He made the trip from Maine to Miami and back several times.